Rob Kiser/Call Photo Covington’s Katie Hembree hits out of a fairway bunker on the fifth hole at Echo Hills Thursday. Rob Kiser/Call Photo Piqua’s Adde Honeycutt blasts out of a bunker near the fifth green Thursday at Echo Hills. 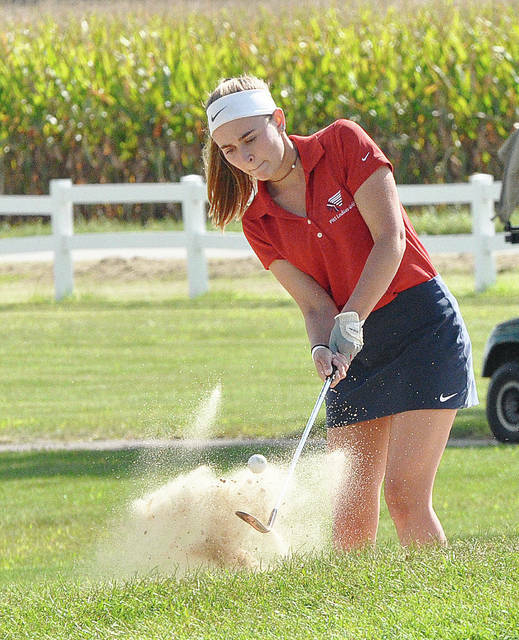 The Piqua girls golf team won a tri-match at Echo Hills Thursday. Team scores were Piqua 198, Anna 203 and Covington 238. Kelsey Bachman was match medalist and led Piqua with a 42. Other Piqua scores were Adde Honeycutt 49, Brooklynne Wright 52, Skylar Sloan 55, Hannah Anderson 59 and Reece Tate 61. Katie Hembree led Covington with a 57. Other Covington scores were Morgan Lowe, 58, Sarah Slusher 61, and Emily Hedrick 62. ARCANUM — Miami East fell to 3-3 overall and 0-3 in the Cross County Conference with a narrow 218-219 loss at Arcanum Thursday. Paige Lawson shot 49 to lead the Vikings, Kearsten Kirby shot 54, Maci Krites shot 56 and Marissa Kearns shot 60. 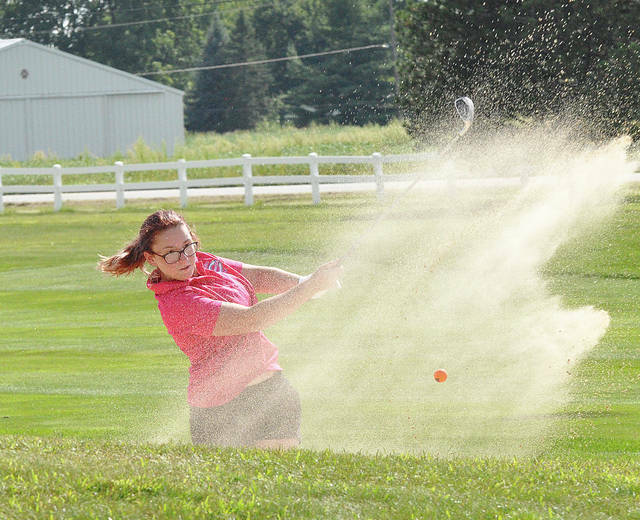 ARCANUM — Miami East fell to 3-1 on the season Thursday, falling to a solid Arcanum team 178-186. Sam Zapadka led the Vikings with a 39 to claim medalist honors. Cooper Elleman shot 47, Tyler Fetters and Andy Bevan both shot 50, Keegan Mahaney shot 51 and Kyle Fetters shot 54. BRADFORD — The Bradford Railroaders dropped a close Cross County Conference match against Mississinawa Valley Thursday, falling 221-222. Keaton Mead led Bradford with a 46 and Joey Brussel added a 54. SIDNEY — The Houston boys golf team lost to Botkins 179-184 in an SCAL match on Thursday at Shelby Oaks. Cole Pitchford led the Wildcats with 44. Collin Walker shot 45, Nathan Stangel shot 47 and Jon Steiner shot 48. WEBSTER — The Russia boys golf team lost 190-204 to Fairlawn in an SCAL match Thursday at Stillwater Valley Golf Course. Jordan Meyer and Grant Saunders each had 50 for Russia. Christian Stueve shot 51 and Drew Sherman shot 53. WEBSTER — The Versailles boys golf team lost a MAC match to Minster 165-177 Thursday at Stillwater Valley Golf Course. Ethan Kremer was co-medalist and led Versailles with a 40. Other Tiger scores were Connor VanSkyock 43, Will Eversole 47, Austin Pleiman 47, Alex Kesier 48 and Iassac White 49. ARCANUM — The Newton boys golf team defeated Tri-Village 166-210 Thursday in CCC action. Chet Jamison was medalist with 37. Other Newton scores were Ross Ferrell 42, Kleyson Wehrley 43, Nate Zielinski 44, Ryan Mollette 45 and Britton Schauer 50. XENIA — The Piqua boys soccer team lost to Xenia 3-0 Thursday. WEST LIBERTY — The Lehman Catholic boys soccer team lost to West Liberty-Salem 5-0 Thursday. CASSTOWN — Miami East took care of business in Cross County Conference play Thursday night, defeating Newton 4-1 at home. Conner Wilson had three goals for the Vikings, while Wes Sutherly added a score on a penalty kick. Sutherly, Quentin Shoemaker and Parker Heim each had an assist. Tristan Stewart had Newton’s only goal on an assist from Dillon Koble. CASSTOWN — The Miami East girls soccer team held off rival Newton in a key Cross County Conference showdown Thursday night, winning 2-1. Cassidy Walker had a goal and an assist and Paxton Hunley had a goal for the Vikings. Michaela Kirk had the long goal for the Indians, cashing in a penalty kick. https://www.dailycall.com/wp-content/uploads/sites/30/2018/08/web1_hembree-2.jpgRob Kiser/Call Photo Covington’s Katie Hembree hits out of a fairway bunker on the fifth hole at Echo Hills Thursday. https://www.dailycall.com/wp-content/uploads/sites/30/2018/08/web1_adde-3.jpgRob Kiser/Call Photo Piqua’s Adde Honeycutt blasts out of a bunker near the fifth green Thursday at Echo Hills.